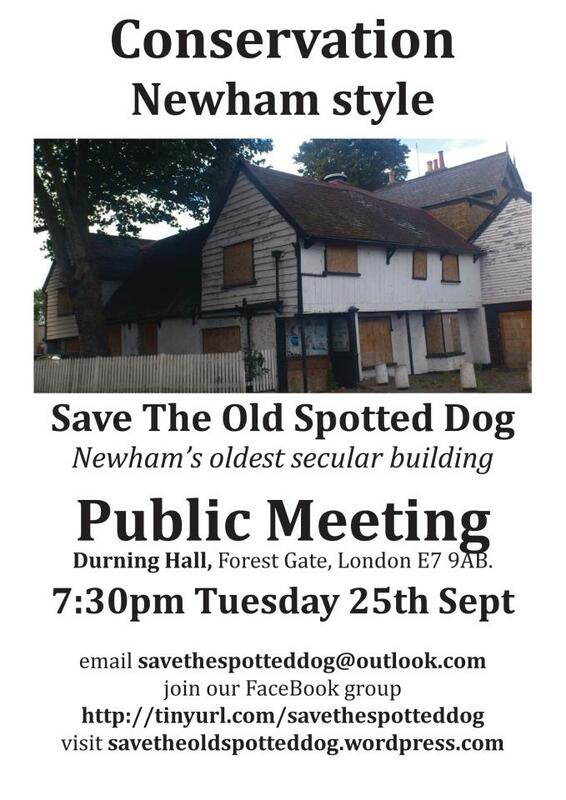 As regular visitors to this site will know, I have a few disagreements with over-zealous anti-social behaviour officers in the past (in Newham and Redbridge) but today, I heard from campaigners trying to save the Old Spotted Dog pub on Upton Lane (above) that they had been stopped from leafletting outside of Forest Gate station and given a advice warning by Newham's 'Law Enforcement' officers. 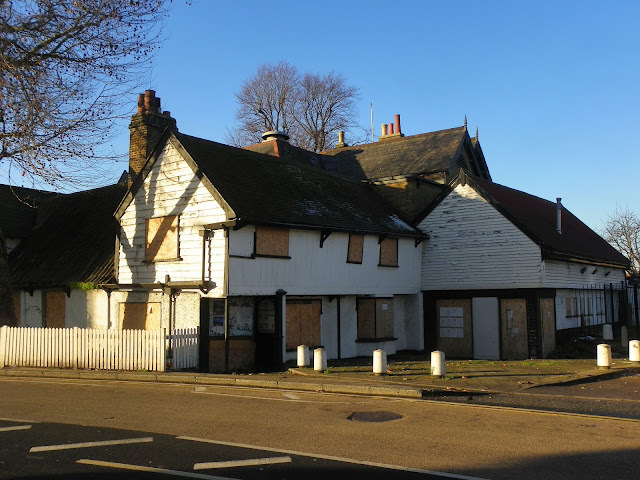 Next Tuesday at 7.30pm, the new campaign has a public meeting at Durning Hall Community Centre about the appalling state of the former pub, which is a seventeenth century Grade II listed building and the borough's oldest secular building. Campaigners were giving out flyers today to encourage people to attend when council 'Law Enforcement' officers intervened, saying they were committing the offence of "distribution of free printed matter on designated land" under Schedule 3A of the Environmental Protection Act 1990. 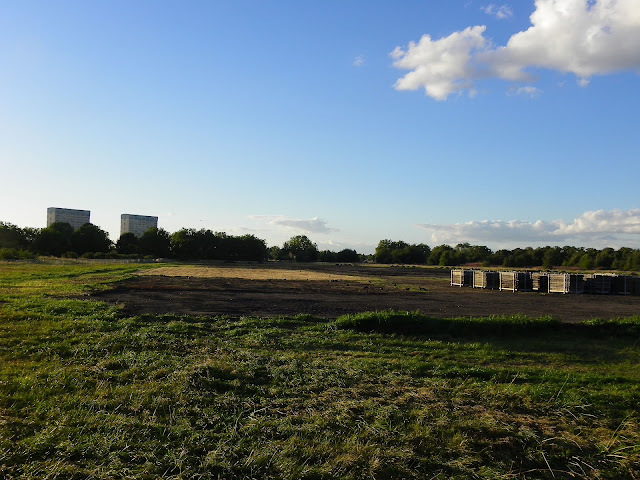 As the leaflets were given out on the public footpath, the enforcement officers were asked what 'designated land' meant and they replied that it probably meant the whole of Newham. 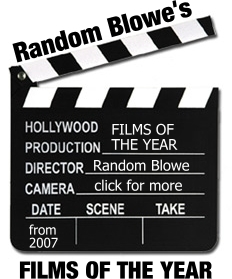 (b) where the distribution is for political purposes or for the purposes of a religion or belief. Promoting a campaign meeting to preserve a 400 year old building strikes me as both charitable and political, so what is Newham council playing at? The campaign is now seeking legal advice. This kind of petty officiousness has to be stopped.For more on the public meeting, see below. 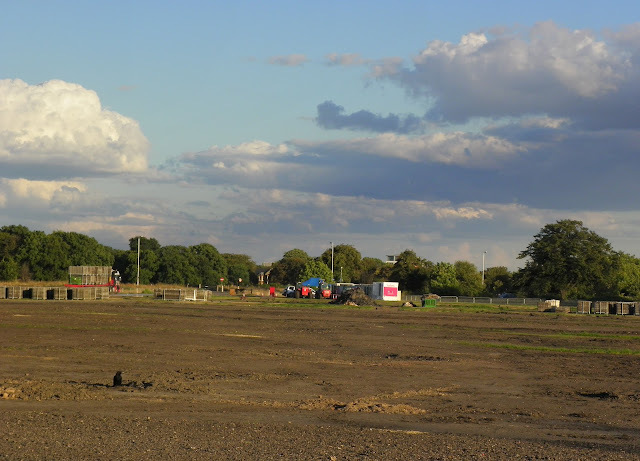 So this evening, I popped over to take a look and to photograph the impact of the base on a much loved piece of public land. 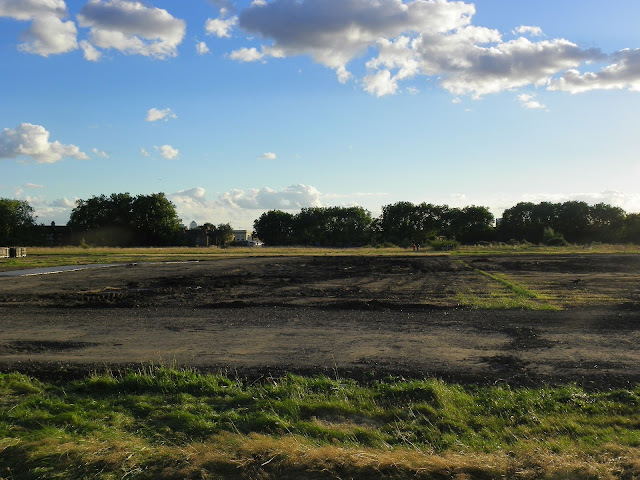 Sadly, as predicted, the destruction is huge - it may take months to recover and parts of the site are covered by gravel and hardstanding. 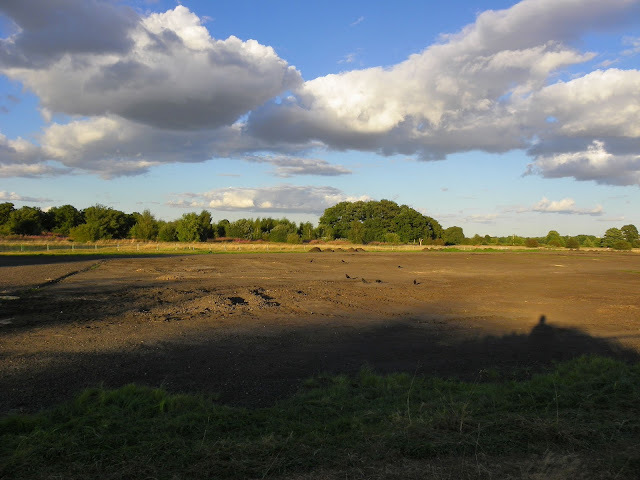 The dark scar on previously protected open land is a real test for the City of London Corporation, who are the nominal 'custodians' of Wanstead Flats as part of Epping Forest. Failing to completely restore the Flats to its condition before the base was constructed will undoubtedly fuel concerns - ones I share - that the site has been earmarked for future use as a "temporary" security space. With the Evening Standard reporting today that it may cost as much as £160 million to turn the Olympic stadium into a football arena, the worry is that the stadium will become the venue for more high-profile, high security events in order to recoup some of its vast costs. High security means a 'convenient' space for basing security operations - convenient for the police and the security industry that is, not for local people. 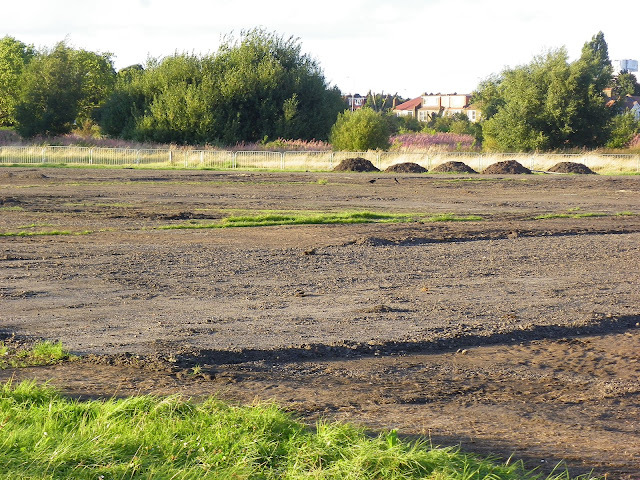 Here are a few photos of the sheer scale of the destruction - you can find more on Flickr. 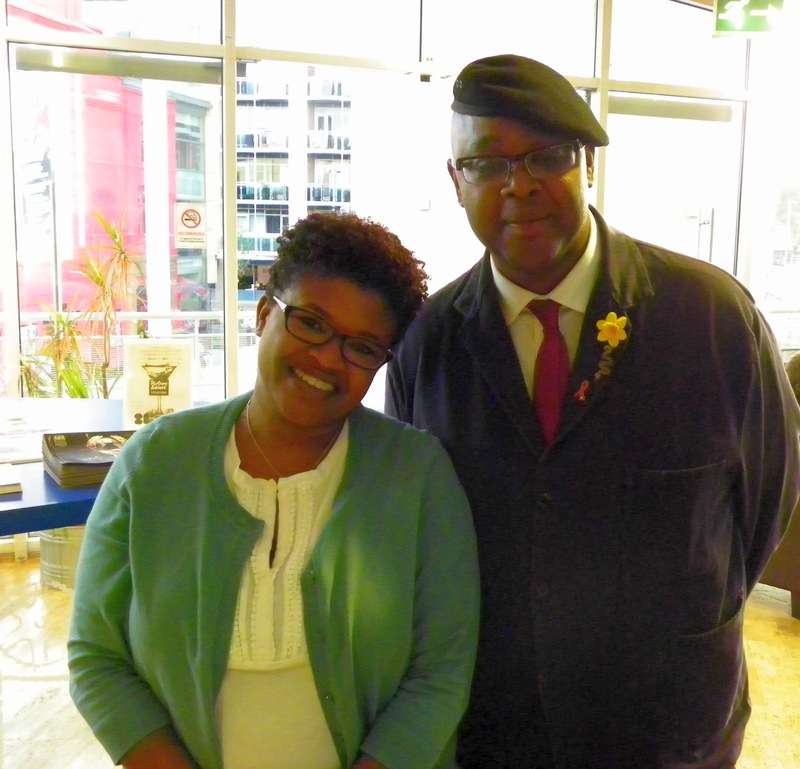 Last night's event at Stratford Picturehouse with Attica Locke, author the the excellent Black Water Rising, in conversation with my old friend Cilius Victor, was one of the most enjoyable Newham Bookshop has organised: more a relaxed chat between old friends than a literary gathering. In fact, Attica has spoken in public with Cilius before, back in 2009 when she was largely unknown and just before she was short-listed for the Orange Prize. Attica's new book is 'The Cutting Season' and is set in a former slave plantation in Louisiana, now an historical site and tourist destination. Last night we discovered it is based on a real place, Oak Alley Plantation, where Attica attended a wedding in 2004. Like her previous novel, her new book examines race in the US and how progress for middle-class African Americans, especially women, is dependent upon the support of others, At a wider level this overwhelmingly means Latino immigrants and there are deep parallels between a new layer of people who hold up an economy but do not have full citizenship rights, who are divided from their families and who in many cases are expected to 'know their place'. Signed copies of The Cutting Season are available from Newham Bookshop - drop in and see if they have any copies left. In Why The Olympics Aren’t Good For Us, And How They Can Be, Mark Perryman offers a timely reminder that sport and politics are always intertwined, and this has been just as true of the Olympics as other major sporting events. He argues, however, that a significant change began in 1984 in Los Angeles, as sponsorship and product placement started to gain greater prominence. By the time of the 1996 Games in Atlanta – the home of Coca Cola – global corporate interests had completed their takeover and aligned the proprieties of the International Olympic Committee to their own. The book, a collection of short essays, goes on to explain how little evidence there is for the alleged benefits – everything from tourism and jobs to regeneration and increased participation in sport – of becoming a Host City. In unpicking the fallacies that demolish ‘the entire promise of the Olympics as something socially benevolent’, it provides a helpful summary of arguments familiar to critics of this summer’s Games. What I find less convincing is the idea that this critique provides the basis for an ‘alternative Olympianism’. Perryman offers ‘Five New Olympic Rings’ to reform the Games. These include decentralising the hosting from cities to nations, and making individual events more open and more of them free-to-watch. The fifth of the new principles is the disconnection of the Games from corporate interests. Perryman is right to argue that the commercialisation of sport is not irresistible, but I see little evidence of a groundswell of grassroots opposition in defence of a genuine ‘Olympic spirit’. More than other events, the Olympics historically has been the plaything of a tight, mainly European clique, an almost arbitrary gathering together of different, largely minority sports. Perryman’s ideas would undoubtedly make a positive impact on the nature of the Olympics as a participatory event. But he seems unclear where the pressure for change, pressure strong enough to topple the powerful commercial interests that control the IOC, might actually come from. Nonetheless the book is an enjoyable polemic – and after a summer of relentless hyperbole about the London Olympics, it will come as a welcome relief to many Red Pepper readers. Back in April I wrote about a campaign set up by local advice agencies who were trying to stop the destruction of independent advice work in the borough and the introduction of a bizarre new system that plans to 'motivate' people not to bother the council with their difficult problems. As part of that campaign, one Newham resident had brought a judicial review of Newham council's decision on 17th November 2011 to cease funding voluntary sector advice services in the borough and to replace it with an in-house system. On 1st June, this challenge was unsuccessful but Mr Justice Cranston held that it appeared the council had ruled out providing funding to voluntary sector organisations for advice services at the November meeting. As a result of this court case, Newham council has effectively withdrawn its decision and assured the court that it would now consider whether to involve the voluntary sector. The judge made it clear that before the council makes a final decision, it must consult properly. A list of libraries is available here and the few remaining service centres here. Drop in and ask for a questionnaire! This afternoon I headed over to Newham Bookshop's stall at Goldsmith Row Book Market, where Clive Bloom was signing copies of his interesting new book "Riot City: Protest and Rebellion in the Capital". I will review the book soon, but Bloom argues that the unprecedented level of unrest in London over the last 12 years has turned the capital into "a battleground for a host of new demands and new ideological standpoints, so much so that protesters and authority alike have had to invent new tactics to cope with the pressure of new demands". There was plenty of evidence of these new demands and new tactics of civil disobedience this weekend, with activists from Climate Siren closing Tower Bridge for around an hour yesterday afternoon, Unite Against Fascism successfully blocking the route of an EDL march in Walthamstow and disabled activists teaming up with UK Uncut to blockade the Department for Work and Pensions (DWP) and Atos headquarters on Friday.